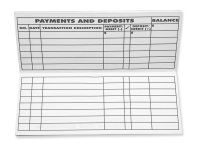 Order a supply of check registers to last you a year. Keeping your supplies handy will save you time and energy. Bulk ordering is faster and cheaper than ordering only one set. 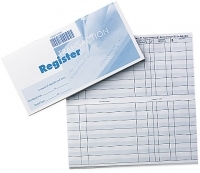 Get lower prices on registers when ordering in bulk. Keep check registers on hand so you don't have to order frequently. Generally when you order your checks they will come with some registers, but it is always nice to have extras to keep on hand. Studies have shown that people who track their spending are more financial stable than those who don't. Make sure you remember to write things down even though online banking helps with record keeping. If your are constantly using your debit card, be sure to order extra debit card registers. Managing your day to day spending is something everyone can benefit from. The hardest financial question people have to answer on a daily basis is, can I afford to buy this? Some people use different criteria to answer that question. Some look in their register and if there is money there, then it needs to be spent. That type of reasoning can get you in a lot of trouble because you fail to look at the big picture of your main financial goals. The entries in your register could be grouped into your budgeted monthly amounts for categories such as groceries, gas, utilities and miscellaneous. However you decide to use your register, make sure it helps you meet your long term financial goals and let it help you stay out of your overdraft account.